Audio is about the same as you get with all the older Samurai films in 2.0. Like the other films from AnimEigo the sound has no extra noises or breaks like hissing or skipping. The PQ is just OK. The film is in black and white and the pq seems to be faded not like the newer releases from AnimEigo. The film does have lines and scratches popping up but barely visible. The weird thing about the film is …..it is in widescreen format but my copy the film isn’t directly centered leaving black side bars on the sides as well with the left bar bigger then the right side. You can check the photo below as I left the lights on as I took the photo so you can see my TV and View the position of the frame itself as well as PQ. One movie Seven Stories whats not to love about this film. Bushido spans 350 years in story and brings the good and the bad endings to each generation starting from Samurai to post war. The film has a little bit of every thing from action, drama, and some parts where i was laughing but I’m sure it wasn’t meant to be comedic. The story’s are cruel and some more than others, while showing you the way of Bushido displaying honor and loyalty even to the death of a warrior that probably didn’t deserve to lose his life. I like the way the story is told running down a timeline of ones family showing 7 different life lines makes this enjoyable. 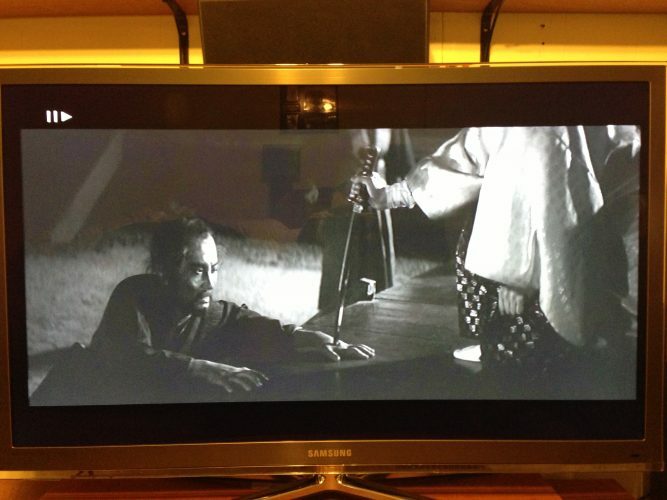 Those that are fond of samurai films and Japanese cinema should give this a look. Its different and its refreshing from the normal samurai films.